Great location, close to Duluth &Superior, & parks like Gooseberry. Nice variety of shops and restaurants. House was comfortable with nice supply of kitchen accessories. Good assortment of games too. It was perfect! Just what we were looking for. It was in a great location and had everything we needed. The property was a good deal, a lot of space and very convent spot for snowboarding at lutsen. However there was no reserved parking for 111a like all of the other condos in the building and that was a pain to deal with! Very easy to work with and answered all of my questions. Our experience was good. We snowmobiled out of the property with easy access to the trails. It is a beautiful home on a beautiful location. when we had questions, staff responded in a timely fashion. Had a wonderful time. Spacious, clean, quiet, beautiful. Would have enjoyed a toaster. Didn't realize there was no network TV, which was a bit of an issue with playoff football game, but had fun with puzzles and other games. I stayed at the same property a year ago and found some of the instructions unclear and didn't have a marked parking spot. The stay was much smoother this time. See you again soon. Great property, well maintained in a great location at a great price. Will plan to stay again. Everything was easy and smooth sailing! No issues! We loved this place and it had a gorgeous backyard and lake view! We did Not have any issues at all! Overall, great experience. Cabin was cozy and stocked with all the essentials and more. Great view of the lake. Always Grace is an amazing property. It is great space for family and friends to gather. We enjoyed our time around the open concept kitchen/dining area...eating good food, playing cards, etc. It is amazing to arrive and find yourself at the water's edge. The deck on the front of the house, the fire pit, it was all just fabulous. Super convenient to Grand Marais for those looking for music and shopping. A few miles up the road - hiking the Kadunce River gorge in winter is a must! Breathtaking! Original art by Birney Quick and David Gilsvick - WOW! Overall rental process was very easy. I like not having to "check in" upon arrival. Overall the property was very nice for our family. We have stayed in a number of the units at Chateau. Most of the units have bulking furniture - a suggestion would be to buy less bulking furniture such as couch and chairs for living room or the log bed frames for the bedroom. The bulky items take up extra space. Having a bed with no bed frame and attaching a thin head board to the wall would provide more room and make the room look and feel bigger. Same thing in the living room. Decorate with more sleek furniture, floor lamp instead of a side table and table lamp, could add a small shelf next to coach for a drink or book. The TV was on a shelf could be mounted to the wall instead. DVD/VCR was also on a shelf with a little creativity it could be placed on top of fireplace. Under TV a bar/counter could be added with some simple wood stools providing more seating and a nice view of the lake. Current stools at the counter top were not very comfortable and the TV is to high on the wall-neck ache! Just some thoughts!! The house and location were fabulous. Plenty of room, super quiet and close to great skiing, hiking and dining. Both women that we talked with at the front desk were very nice and helpful. We really enjoyed our time here. We were in Unit 1, very cozy and warm. Loved the fireplace and the easy access to the lake. Everything that we needed was provided and that made it such a pleasure. Members of your team were great! Friendly, kind and helpful. We enjoyed our stay very much. Unit 30 was quiet with a great view of the lake. The furniture was comfy as were the beds. It was nice to have the twin beds for our adult children. Pool/hot tub area was neat and clean. Pool a little on the cool side but refreshing when getting out of hot tub. Would be nice to have pool area open till 11pm on Fri and Sat. Lobby is very inviting with sofas, chairs and tables...nice large space to watch TV, read or just relax and enjoy the beautiful view! Dennis and Maggie were very friendly and helpful at the front desk. I love Towering Pines. Stayed there many times over 15 years. We bring our own porch furniture cushions each stay so we can enjoy the porch in comfort. Very easy to work with and I appreciated the email updates sent to me as we neared our arrival date. We didn't realize the check out time was 10am and with teenagers we were running behind. The office called and let us know that the cleaning person had arrived and was waiting on our departure. They were very understanding and kind. What an amazing winter weekend on Lake Superior! We shared the house with another couple and 2 teenagers! Great sleeping arrangements - put the teens in the basement with an airmattress and some late night movies that we didn't have to hear! We hunted for agates on the beach, had a bonfire on a 38 degree January day, and let the sound of the waves put us to sleep! Played games, did a puzzle (and I think a couple guys I know napped in the great room)! Loved the privacy and the view! The house was spotless! The kitchen was a great gathering spot. Could imagine one day updating the bathrooms, but nothing was gross or unusable. The Cascade Team was great to work with! The log lodge home is spacious, yet cozy. The home is equipped for preparing your own meals, and offers use of a washer and dryer. It also features a lovely deck, both screened and not for enjoying the beautiful outdoor scenery. 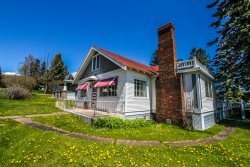 Its the perfect location to stay for enjoying skiing at Lutsen, visiting Grand Marais and hiking the different trails along the rivers and parks. We absolutely loved the Eagle's Nest! Easy to work with and always available to help if needed. very easy website to use very friendly people when you need to talk to them. go out of their way to make things the way you want them. Great properties, easy to work with. Loved the location and everything in the house was as stated.